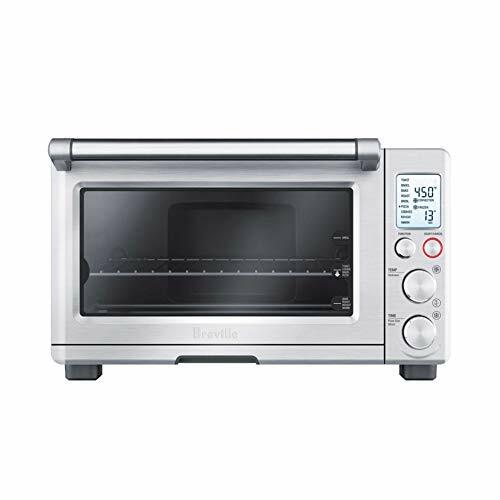 The Breville BOV845BSS Smart Oven Pro with light and slow cook setting is the first oven with Element IQ that controls heating elements to suit whatever you are cooking with 10 preset functions. Slow Cook Function will automatically switch to Keep Warm for up to 2 hours and can be set at 'HI' 2-8 hours, or 'LO' for 4-10 hours. Key features comprise of a timer with auto shut-off and alert, temperature conversion & frozen food functions, a color changing LCD, and a magnetic auto-eject rack. Accessories included with your oven are a 12" x 12" enamel baking pan, a 12" x 12" enamel broiling rack, and a 13" non-stick pizza pan. The 0.8 cubic foot interior allows for a 6-slice toast capacity, and as a guide, can accommodate most 3.5 quart Dutch oven vessels with lid, and 5 quart vessels with foil lid. Voltage - 110-120 volts , Power - 1800 watts. 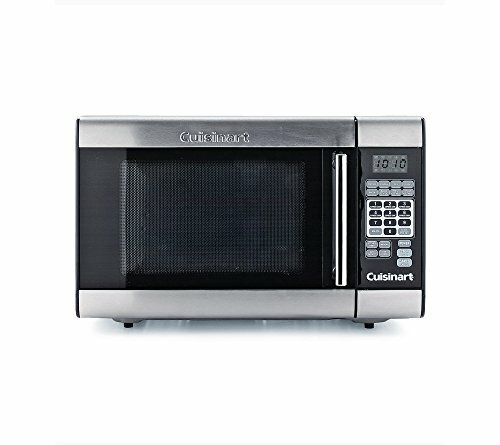 Easily cook and prepare meals inside this sleek, stainless steel Cuisinart microwave. Fits 4 slices of bread or a 9 pizza - easily fit a 9 pizza, four slices of bread, or a variety of other snacks and meals. 30-minute timer with stay-on - the precise cooking timer features a stay-on function for Longer baking tasks. Bake pan and rack included - the included rack and bake pan fit perfectly in the toaster oven. Taking your cooking to a healthy new level is easier than ever with this 12-in-1 multifunctional air fryer oven. Designed to fry up tasty meals without the extra fat or calories, this oven is also built with a 360-degree rotating system for rotisserie cooking, along with a dehydration function for fruits, veggies, and much more. Cook nearly any meal with 12 pre-set cooking options, efficient heat circulation, and a capacity large enough for a whole chicken! Select what's for dinner on the LCD touchscreen and cater a convenient yet delicious meal to the whole family! 12 EASY PRESETS & 7 ACCESSORIES: 12 pre-set cooking options vary from steak to chicken, cake to cookies, and so much more, viewable on the LCD touchscreen display. 7 accessories include a deep frying pan, roasting racks, and even a bird roaster! Want cooking versatility at your fingertips? 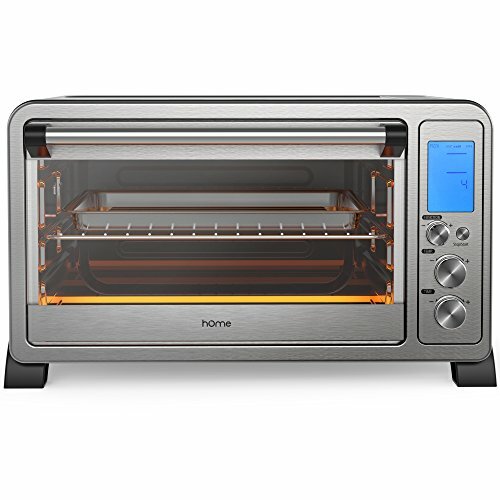 The hOmeLabs 6 Slice Convection Toaster Oven is your answer. Toasted bread for some sandwiches? No problem. Feeling a 12 inch pizza? You got it. Want a completely roasted chicken? Well, not the most common request, but that can easily be taken care of too! Product Functions & Features Toast function: For foods such as bread, cookies, and heating food. Fits up to 6 standard slices. Bake function: For foods such as less tender cuts of meat, soups, and stews Broil function: For foods such as fish, beef, steak, and vegetables. Broiler rack included. Pizza function: Fits frozen or thawed 12 inch pizza Cookies function: Bakeware sheet pan included Rotisserie function: For roasting a small whole chicken. Rotisserie fork included. Defrost function Reheat function Keep Warm function Convection function LCD digital display screen For full care instructions and safety warnings, always refer to product manual (included with purchase). 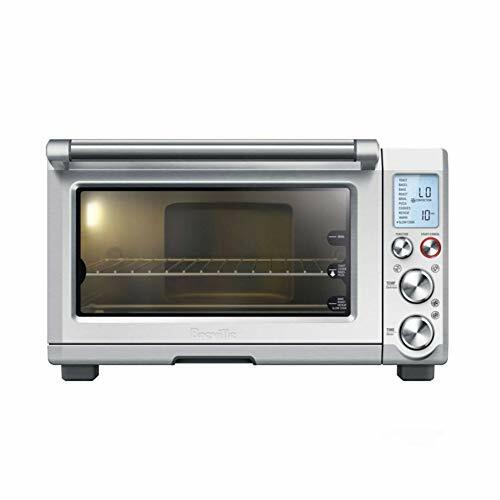 PREMIUM FEATURES - Features a digital LCD display with easy to use controls that allows you to set temperature up to 450 F and choose from 10 different cooking functions that includes toasting, baking and broiling. FLEXIBLE RACK POSITIONS - Allows for 3 rack positions that give you total control over how you place your pans when you're baking bread, muffin, 12 pizza or roasting chicken. 120 minutes of steady, uninterrupted steam , UC LWH: 22.05 x 17.32 x 13.27 ; MC LWH: 23.15 x 18.03 x 14.49. 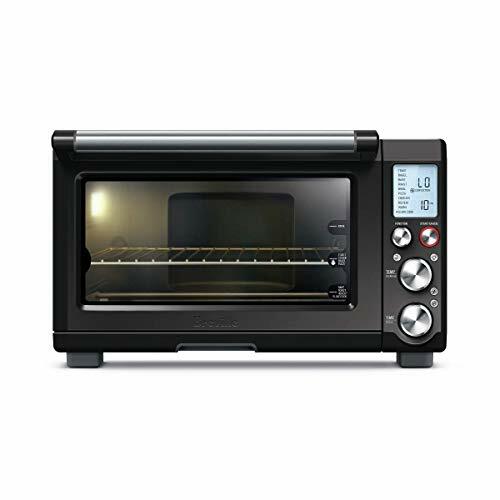 The smart oven Pro with element IQ is an essential tool for the cook who desires a countertop oven that bakes the perfect pizza pie, crispy yet chewy cookies, toasts evenly and roasts succulent meat. The convection setting reduces cooking time by up to 30%. Voltage 110 120 volts. Features an interior oven light to keep an eye on your cooking; The walls on the inside of the oven feature a non-stick coating for easy cleaning. 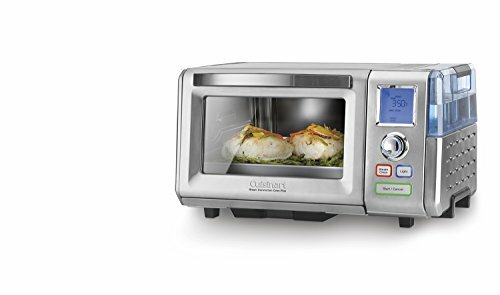 Cook up your favorite foods with ease in this Convection Toaster Oven. Whether it needs to be toasted, baked or broiled this covers it all. It even makes cleanup easy with a slide out tray! Convection cooks faster & more evenly. 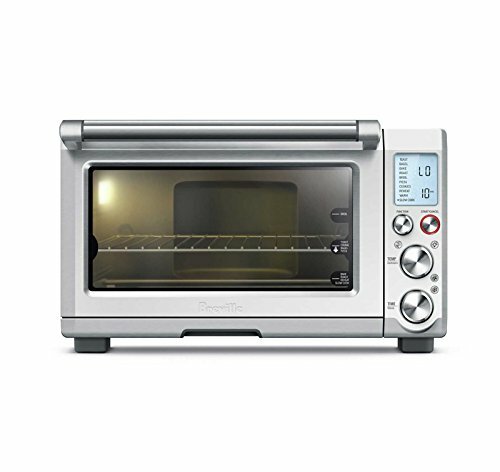 Toast, bake & broil settings with Bake pan and broil rack included. Fits 6 slices of bread or 12 pizza. Stay On setting and 30 minute timer with auto shutoff and ready bell. 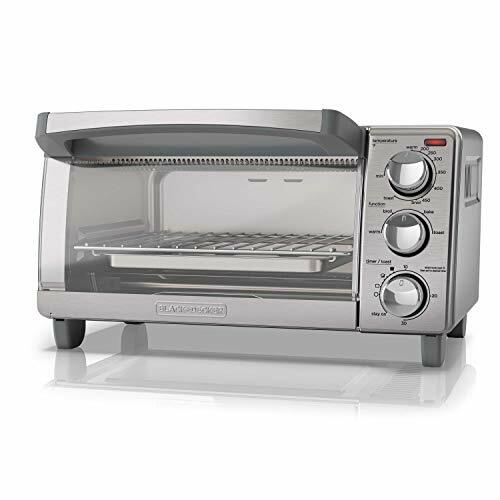 The Smart Oven with Element IQ is a trustworthy tool for the cook who wants a countertop oven that roasts succulent meat, broils, bake pizza, reheas leftovers and toasts evenly. Convection setting reduces cooking time by up to 30%. SMART ELEMENT IQ - There's heat, and there's smart heat. Element IQ transfers heat intelligently across 5 quartz elements for precise and stable heat just where and when you want it for perfect results, every time. Super fast 1800W preheat gets your meals on the table more quickly. CONVECTION POWERED - You're not a Pro without an inbuilt fan that circulates the hot air within your oven. Convection speeds the cooking process by raising hotter air and sinking colder, less dense air for quicker heating. 9 COOKING FUNCTIONS - 9 cooking functions to guide you to perfection: Toast 6 slices, Bagel, Bake, Roast, Broil, Pizza, Cookies, Reheat and Warm. LCD DISPLAY - LCD DISPLAY to more easily access the built in smart functionality, choose from 9 cooking functions. Integrated oven light automatically turns on at the end of cooking cycle or can be switched at the touch of a button. SUPER CONVECTION TECHNOLOGY - The Smart Oven Air's 2-speed convection fan (Super & regular) offers greater cooking control. Super convection provides a greater volume of air to ensure fast and even heat distribution, perfect for air frying, dehydration and roasting. PRECISION COOKING & ELEMENT IQ - We've taken the benefits of Element IQ one step further by adding Breville sensing and PID temperature control technology. With Element IQ - 6 Independent quartz heating elements move the power where it's needed most, above and below the food for perfect results. 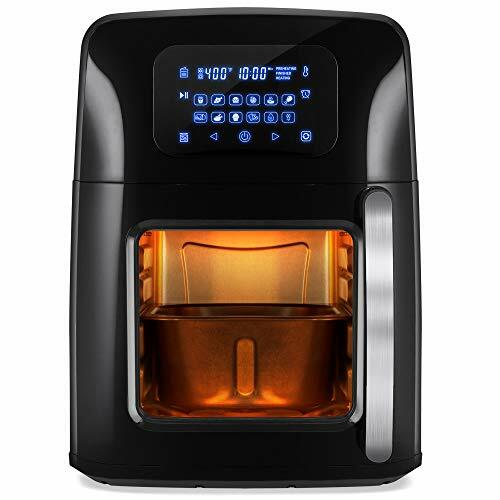 AIR FRY & DEHYDRATE PRESETS - Why buy a stand alone air fryer or dehydrater when the Smart Oven Air can air fry french fries and other family favorites and dehydrate a range of foods. Dehydrate up to 4 trays of goodness. SIZE MATTERS - The large, 1 cubic ft, interior makes room for toasting 9 slices of bread, roasting a 14-lb turkey, air fry favorites like French fries, slow cook with a 5 qt Dutch oven and comfortably fit most 9x13 pans and 12 cup muffin trays. 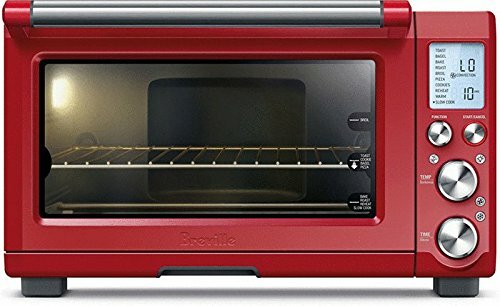 SUPER VERSATILE - 13 cooking functions to guide you to perfection: Toast 9 slices, Bagel, Broil, Bake, Roast, Warm, Pizza, Proof, Airfry, Reheat, Cookies, Slow Cook, Dehydrate. SMART ELEMENT IQ - There's heat, and there's smart heat. Element IQ transfers heat intelligently across 5 quartz elements for precise and stable heat just where and when you want it for perfect results, every time. Super fast 1800W preheat gets your meals on the table more quickly. CONVECTION POWERED - You're not a Pro without an inbuilt fan that circulates the hot air within your oven. Convection speeds the cooking process by raising hotter air and sinking colder, less dense air for quicker heating. SLOW COOK FUNCTION - Some days you want to take your time to tenderize and develop complex flavors. That's why we have a slow cook function, designed for long cook times at low temperatures. You can slow cook for up to 10 hours before the setting automatically turns to keep warm. 10 COOKING FUNCTIONS - 10 cooking functions to guide you to perfection: Toast 6 slices, Bagel, Bake, Roast, Broil, Pizza, Cookies, Reheat, Warm, Slow Cook. INTERIOR OVEN LIGHT - Integrated oven light automatically turns on at the end of the cooking cycle to help you see inside. Auto shut off and independently controlled button. Replaceable componentry like your regular large oven. SLOW COOK FUNCTION - Some days you want to take your time to tenderize and develop complex flavors. That's why we have a slow cook function, designed for long cook times at low temperatures. You can slow cook for up to 10 hours before the setting automatically turns to keep warm. 10 COOKING FUNCTIONS - 10 cooking functions to guide you to perfection: Toast 6 slices, Bagel, Bake, Roast, Broil, Pizza, Cookies, Reheat, Warm, Slow Cook. INTERIOR OVEN LIGHT - Integrated oven light automatically turns on at the end of the cooking cycle to help you see inside. Auto shut off and independently controlled button. Replaceable componentry like your regular large oven. 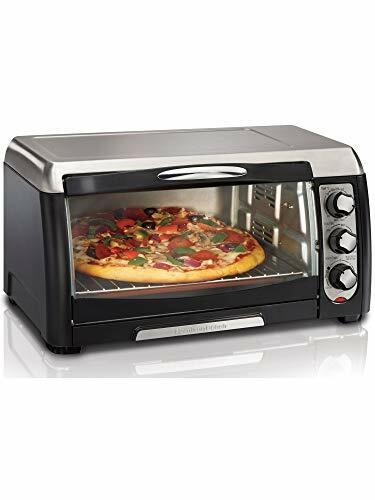 The Smart Oven Pro With Element IQ is for the cook who desires a countertop oven that bakes the perfect pizza, crispy yet chewy cookies, toasts evenly and roasts succulent meat. The convection setting reduces cooking time by up to 30%. Enjoy all the cooking power of a traditional oven in a compact and powerful countertop design to create quick, delicious meals! 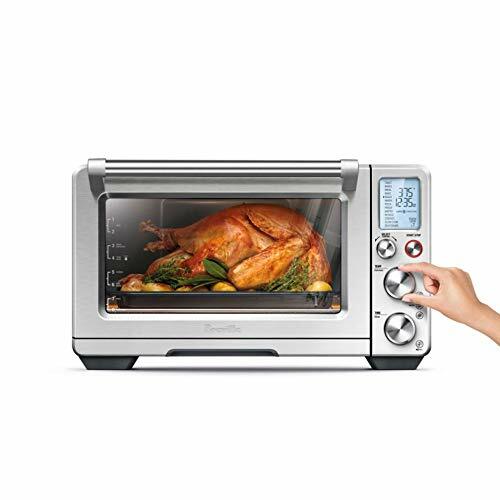 This turbo convection oven can do it all: bake, roast, steam, grill, and air fry. No need to thaw frozen meat, no need to add oil, saves energy compared to traditional ovens and cooks healthy food in half the time. It heats quickly and efficiently while sealing aroma and moisture for maximum flavor. You may select the cooking temperature and cooking time for your food. The hot air inside the oven will never bring about smoke, nor will the food be burnt. Your kitchen is then clean and safe, free from contamination. The convection oven not only saves you from the heavy kitchen work, but also makes your cooking enjoyable. Versatile cooking for flavorful dishes The air fryer toaster oven has the ability to defrost, broil, roast, bake, steam, grill, and BBQ. Perfect for chicken, steak, ribs, fish, shrimp and more. No need to preheat or defrost frozen meat for the best flavor and taste. Saving time and energy Due to the high efficiency of the hot moving air in the oven, the cooking time and the consumed energy are reduced to minimum. Our experiment shows that the convection oven saves electricity up to 20% as compared to ordinary ovens.With a wide temperature range from 200-450 degrees Fahrenheit, you can cook everything you can imagine in here without fear of improper cooking times and temperatures. A Healthier Way of Cooking The convection oven cooks with rapid heating and little oil, retaining the natural flavors and nutrients for making healthy diets easy to prepare and keep. It steams, it air fries, and it cooks smart so you can always eat healthy. The Gemelli Twin Oven: The First and Only - Convection Oven with Built-In Pizza Drawer and Rotisserie. The Gemelli Twin Oven takes the everyday functionality of a professional grade countertop convection oven and adds a rotisserie feature - for healthy cooking; along with the convenience of a separate lower oven, with built-in pizza drawer - for fast meal preparation. The main oven features a combination of infrared and 4 quartz heating elements to provide fast and optimum temperatures (up to 450 ) for cooking and baking. 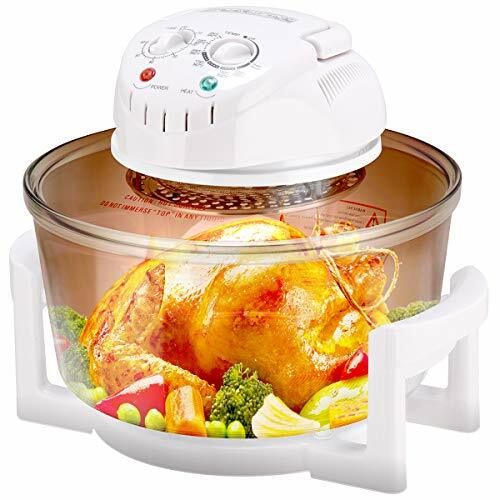 Plus, the rotisserie feature allows you to cook a variety of healthy and flavorful meats (up to 5-6 lbs evenly) while unwanted fats drip away. 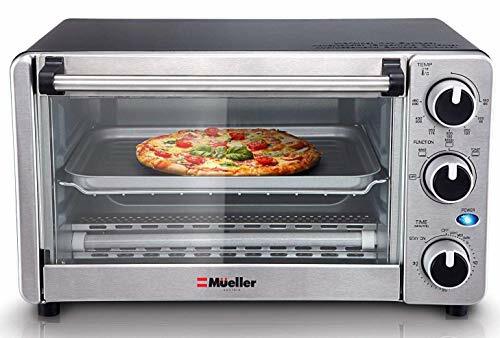 The bottom oven is specially designed for cooking 12" pizzas, quesadillas, toasting bread, bagels, frozen snacks and more... without the need for an extra sheet pan. 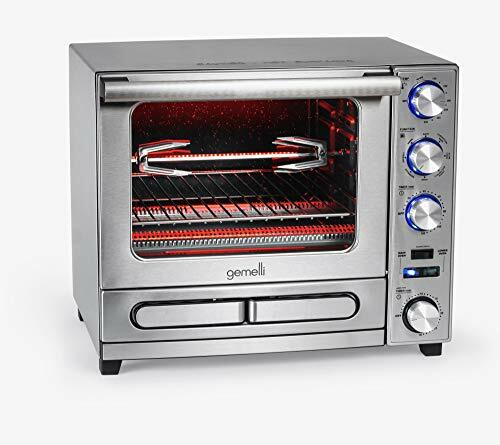 The simple knob controls, timer, non-stick coating, and elegant stainless steel finish - Makes the Gemelli Twin Oven easy to use, easy to maintain, and durable enough to last for years to come. BUILT-IN PIZZA DRAWER: The separate lower oven, with built-in pizza drawer, allows you to cook your favorite 12" pizza, frozen snacks, toast bread, bagels, and more... without the need for an extra sheet pan. ROTISSERIE READY: Comes with removable 5-pc chrome rotisserie spit rod & fork set. The removable rotisserie set allows you to cook a variety of healthy and flavorful meats (up to 5-6 lbs evenly), while unwanted fats drip away. FASTER COOKING: No need to preheat: Cooks food 30% faster than standard conventional toaster ovens in the market. / MULTI-FUNCTIONAL COOKING: 3 rack positions + 8 cooking functions (choose from: Bake, Convection Bake, Slow Cook, Convection Roast, Broil, Rotisserie, Defrost, and Keep Warm functionality). EASY TO USE: The simplicity of our stainless steel knob design, makes this oven intuitive and easy to operate. / EASY-TO-CLEAN: Stone-gray non-stick coating makes the interior of this oven easy to clean.